It's been a long time since I've played Mario Kart or one of its clones. In fact, I never had a Nintendo system at home, so the only time I've actually played the game was at a friend's place probably over a decade ago, and it probably wasn't even the original 1992 Mario Kart but the 1996 Mario Kart 64. I did play a Mario Kart clone in my youth though and it was for the PC. The game was called Wacky Wheels and was published by Apogee in 1994. Ah, so many good memories. Anyway, in the past year or so, I developed a hankering for another one of those kind of games and that's why I've been keeping an eye on Sonic & All-Stars Racing Transformed for some time. Why? For a couple of reasons: (1) it's received a Steam rating of "Overwhelmingly Positive" and (2) it has an interesting roster of drivers you can pick from, including the chaps from Team Fortress 2 - whaaat? It was only thanks to the recent Sega Humble Bundle sale that I managed to finally get this game along with a few other Sega titles for the rock-bottom price of $5.00 USD. So is this game as good as the Steam community make it out to be? Is this a worthy Mario Kart clone to try out? What's the deal with the weird title? 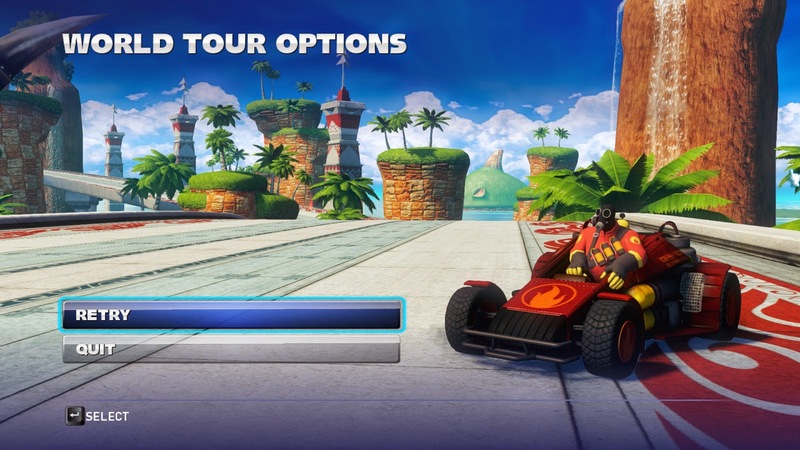 Sonic & All-Stars Racing Transformed is basically Sega's answer to Mario Kart. You basically race around a track while looking for boosts, power-ups and weapons that can give you an edge. You're also able to race as one of the many characters from Sega's franchises such as Sonic the Hedgehog, Tails, Doctor Eggman, Ulala from Space Channel 5, B.D. Joe from Crazy Taxi, Gilius Thunderhead from Golden Axe and even some less orthodox candidates such as General Winter from Company of Heroes 2, Willemus from Total War: Rome II and Football Manager from Football Manager. There are even non-Sega related characters such as NASCAR driver Danica Patrick, Wreck-It Ralph and the fellows from Team Fortress 2. There's sure to be a favourite amongst the line-up although I'm sad there are no characters from my favourite Sega game, Streets of Rage. Oh, well enough of my sob story, so the game is very similar to Mario Kart then with the exception of which characters you can choose from, right? But wait... there's more! There's a reason the game title has the word "Transformed" at the end because that's exactly what your vehicles and even the maps themselves do - they transform! After each lap, the map changes but not only with respect to the route the circuit takes but even what vehicles you will employ. You might find that in your first lap you're just driving a car, but the second one might involve flying a jet or driving a boat. While having the ability to morph your vehicle into a number of wacky alternatives is probably not everyone's cup of tea, it definitely makes things interesting since you might be good at handling a car well enough but what about a plane or a boat? The handling characteristics change and sometimes dramatically meaning a player who is a jack-of-all trades might have a better chance of winning than one who is a gun at one mode of transport but not the others (it also depends largely on the maps themselves). So I don't really have many complaints when it comes to the gameplay except how easy it is to lose sight of the track while flying in plane mode. 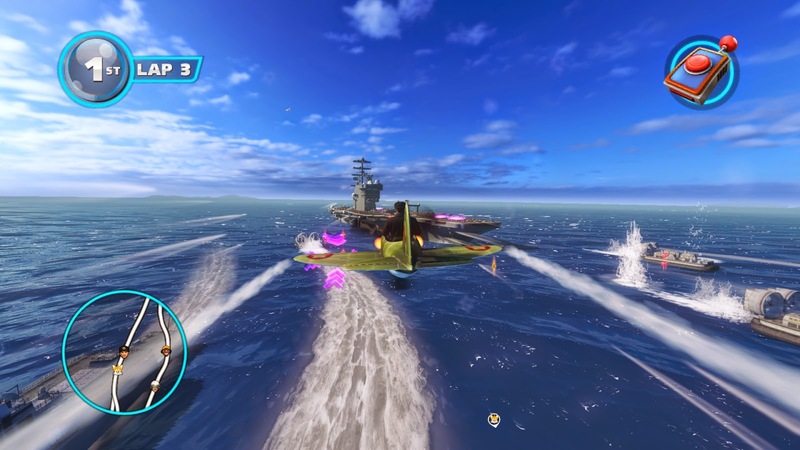 In car or boat mode, you can usually figure out where you are with respect to the track - physical obstacles or vertical drops tend to steer you towards a certain direction. Unfortunately, this isn't always the case with plane mode and there may be some frustrating situations where you'll be hitting invisible walls trying to find which direction is the right one. Sure you have the minimap to show you where the track itself is, but it doesn't show which direction you're facing. Sega and Sumo Digital have actually managed to grab most of the original voice actors to reprise their roles, which is fantastic considering there is an eclectic mix of characters for the player to choose from. I mean they even managed to get Danica Patrick to do some voice acting for the game. In terms of other sound effects in the game they're what you'd expect to hear from an arcade racer. The game has some pretty spectacular looking maps to drive/fly around. I especially like the carrier fleet one. Also, all the characters that you're able to play with look exactly as they do from their respective franchises (some look even better considering how old some of the franchises are). Besides my initial reservations about the game, I actually enjoyed it immensely but how likely are you to continue playing when there's nobody to play multiplayer with? I've always found that Mario Kart clones are at their best when played with other humans but sadly there doesn't seem to be anyone still playing this game - at least during the hours I'm up :). I didn't find any serious bugs while playing the game but it's annoying how you have to access a separate program to configure the controls. I probably shouldn't complain because at least they give you the option to change the controls unlike many games where the keys are hard-coded. Also, the game doesn't really teach you how to play so when I did my first race I didn't even know how to start the car (until I found the aforementioned config tool). There's also a lot of concepts that aren't explained which would've benefitted from a tutorial (e.g. how some weapons will end up hurting yourself if you don't aim backwards). Sonic & All-Stars Racing Transformed is exactly what the title (and its slogan) claims it to be: it's racing transformed! Your vehicles and even the tracks themselves transform during the course of the race which keeps you on your toes and means there's never a dull moment while you're playing this game. You're also able to play as one of several Sega characters including some characters that aren't even part of a Sega franchise (e.g. the Heavy, Spy and Pyro from Team Fortress 2). The only downfall to this game, along with any arcade racer is that multiplayer is king and if you're unable to find anyone to play this game with, things will start to get dull pretty quick. If you have some like-minded friends or kids to play with though - it could work a treat.